The village of Fins was captured in early 1917 as the German Army withdrew to the Hindenburg Line and remained in British hands until the German Offensive of March 1918 retook the ground. 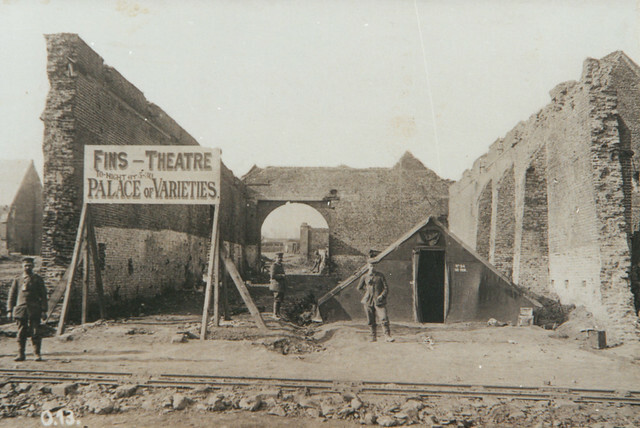 This photograph comes from a German source and shows a captured British Theatre in what had been a ‘behind the lines’ location until March 1918. The infrastructure behind the front is often forgotten and the existence of Theatres like this close to the battlefield for troops out on rest largely unknown. This particular ‘Theatre’ is nothing more than three walls of an old French barn and it appears whatever facilities were on-site for the ‘talent’ are found in the tent! The Germans were obviously amused to find this particular facility when they retook Fins but probably more concerned with the well stocked supply depots also to be found in the village. This entry was posted on 15/01/2012 by sommecourt. It was filed under BEF, British Army, France, German Army, Somme, Western Front, WW1 . Very good, ” NEW WEB SITE ” look forward to see what it has to offer!!! !